We drove across to Boulder, Colorado recently. Yep! All of 1011 miles through temperatures as high as 104F in Iowa and Nebraska. A no-mess cooler made the trip really pleasant. 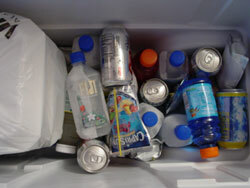 The trick is to freeze water in strong plastic bottles and use that as the cooling agent. Fiji Water not only tastes great, but comes in just the kind of plastic bottles you need - the plastic smell of the bottles does not transfer to the water. I found Fiji Water at Trader Joe's. Since I did a test-drive with these on our Branson trip, I only had 6 bottles with the original Fiji Water in them. I really didn't mind cos I filled the rest with Chicago water - just about the best tasting water in the country. And as the ice melted, we had a supply of chilled water that tasted great, no mess in the cooler and the cooler was a lot lighter and easier to handle. Because there was no water directly in the cooler itself, we could carry food in the cooler without having to wrap it in air-tight or water-proof containers. 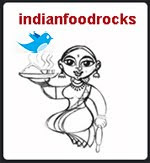 Which worked out very well for us Indian Food Junkies! We had delicious left-overs from a dinner at an Indian restaurant in Lincoln, Nebraska which served as lunch the next day. Yum! There we were in the first rest area in Colorado, along I-80, eating cold saag paneer and navratan korma. It was 102F so the cold food was a real treat! That's my cooler! I also discovered that 12 oz Gatorade bottles freeze very well. As do Caprisun pouches. Fiji water bottles are expensive - they cost over $6 for a six-pack of 500 ml bottles. A carton of 10 Caprisun pouches costs much less ($2.50) so it might make sense to buy 2 or 3 Caprisun packs, freeze them and carry drinking water in regular water bottles. Needless to say, I'm saving all my Fiji water bottles for future trips.